On 5th November 1875, two friends, John Lewis and Arthur Constantine, organized a meeting at the St Leger Hotel in Blackburn to discuss the possibility of establishing a football club in the town. Constantine had played the game while studying at Shrewsbury School. At that time, the game was dominated by former public school students. Seventeen men attended the meeting and as Charles Francis pointed out in his book, History of Blackburn Rovers (1925): "all present, including several young fellows who had just finished their education at public schools, signified their willingness to participate in the game and the motion to create a club was carried unanimously." Lewis agreed to be treasurer of Blackburn Rovers and Walter Duckworth, a former pupil of Clitheroe Grammar School and the son of a local timber merchant, was appointed as the club's first secretary. Two local businessmen, Alfred Birtwistle, directory of a local firm of cotton manufacturers, and Richard Birtwistle, whose family owned cotton mills in the Blackburn area, also became involved in running the club. Jack Baldwin, the son of a wealthy Blackburn businessman, also agreed to play for the team. J. T. Syckelmoore, a former student of St. John's College, Cambridge and a teacher at Queen Elizabeth's Grammar School in Blackburn also joined the club. So also did Thomas Greenwood, who was appointed captain of Blackburn Rovers. His two brothers, Harry Greenwood and Doctor Greenwood, also played for the club. Two other brothers, Fred Hargreaves and John Hargreaves, who both worked in the legal profession, became important figures at the club. They had played football for Malvern College and advocated that Blackburn Rovers adopted the quartered shirt design of their school shirts. However, they suggested that the traditional green should be changed to the light blue worn by the Cambridge University football team. Jimmy Brown was another local man who joined the team. He had played football for Mintholme College, and Blackburn Law Club before joining Blackburn Rovers. 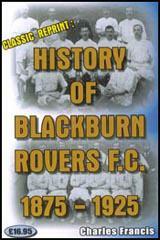 Blackburn Rovers played their first game on 11th December 1875. The team included Alfred Birtwistle, Walter Duckworth, John Lewis, Arthur Constantine, J. T. Syckelmoore, Thomas Greenwood, Harry Greenwood and Jack Baldwin. The game ended in a 1-1 draw. The team played its early games at Oozehead, a piece of farmland on the road to Preston. In 1877 they began playing matches at Pleasant Cricket Ground. At a game against Preston Rovers in December, Henry Smith, collapsed and died of a heart-attack. The following year Blackburn Rovers moved to the ground used by the Alexandra Meadows Cricket Club. According to the author of The Book of Football: "It was a modest beginning, and as the enthusiasts had no idea of the future that was in store, no complete records were kept for the first few seasons." Those existing documents show that Arthur Constantine apparently left the club in 1877. Greenwood (10), Doctor Greenwood (11) and Arthur Thomas (13). On 4th November 1878 Blackburn Rovers played its first floodlit game. As Mike Jackman has pointed out in his book, Blackburn Rovers: An Illustrated History (1995): "The visitors were Accrington and the ground was illuminated by the Gramme light - one being situated at the east end of the Meadows and the other at the west end. Each light was attached to a scaffold that rose some 30 to 40ft from the ground. An 8hp portable engine was required to work the battery and it was said that the system provided the equivalent of some 6,000 candle power. However, it was felt necessary to paint the ball white to aid both players and spectators." Blackburn Rovers was not the best football team in Blackburn. Whereas Rovers was mainly made up of players who attended public schools, the Blackburn Olympic team largely contained men from the working-class and was funded by Sidney Yates of the local iron foundry. The two clubs played each other on 15th February 1879 but Olympic, one of the best teams in the country, won 3-1. 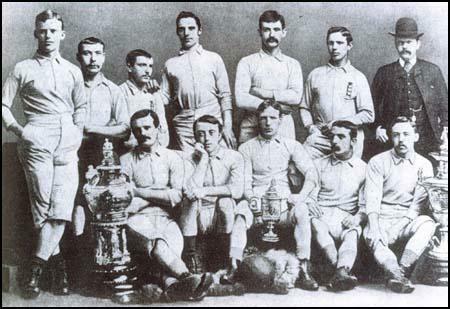 In the 1879 Blackburn Rovers entered the FA Cup for the first time. However, after beating Enfield in the first round they lost to Nottingham Forest 6-0. They had better luck in the Lancashire Cup and got to the final before being beaten by Darwen 3-0 in front of 10,000 spectators. It became clear that Blackburn Rovers would have to persuade some better players to join the club. In 1880 the club signed Hugh McIntyre from Glasgow Rangers. McIntyre was attracted to the town by his appointment to run the Castle Inn. Another footballer who had learnt his trade in Scotland, Fergie Suter, who had been playing for rivals Darwen, also joined Blackburn. This enraged Darwen who accused Blackburn of paying Suter for his services. At this time football professionalism was illegal. However, Darwen did not make an official complaint as it was well known that Suter had given up his career as a stonemason as soon as he arrived in Lancashire. McIntyre and Suter had both played their early football in Scotland. So also did their third signing, Jimmy Douglas who had played for Paisley and Renfrew. Blackburn Rovers played Darwen in a friendly on 27th November 1880. In an attempt to embarrass Blackburn Rovers for recruiting Scottish players, Darwen officials announced that their team would only include men who had been "Darwen born and bred". The score was 1-1 when in the second-half the players began fighting after an incident involving Fergie Suter. The crowd joined in and the referee was forced to abandon the game. The team relied heavily on the three Scotsmen brought into the side: Hugh McIntyre, Fergie Suter and Jimmy Douglas. However, the team included some of the men who originally formed the team such as Fred Hargreaves, John Hargreaves, Doctor Greenwood, Jimmy Brown and John Duckworth. The men who ran Blackburn Rovers also decided to invest in a new ground. A lease was taken out on a ground on Leamington Street and £500 was spent on building a grandstand that could accommodate between 600 and 700 spectators. A wall was erected along the sides of the pitch in an attempt to stop crowd invasions. The first game at the new stadium was against their old rivals Blackburn Olympic. A crowd of 6,000 people saw Blackburn Rovers win 4-1. Blackburn Rovers was now one of the best clubs in England. 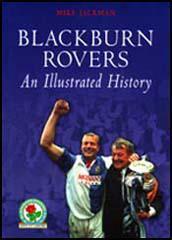 In 1882, Blackburn became the first provincial team to reach the final of the FA Cup. Their opponents were Old Etonians who had reached the final on five previous occasions. However, Blackburn had gone through the season unbeaten and was expected to become the first northern team to win win the game. Doctor Greenwood was injured the team included five players who had won international caps, Jimmy Douglas, Fred Hargreaves, John Hargreaves, Hugh McIntyre and Jimmy Brown. The Old Etonians scored after eight minutes and despite creating a great number of chances, Blackburn was unable to obtain an equalizer in the first-half. Early in the second-half George Avery was seriously injured and Blackburn Rovers was reduced to ten men. Despite good efforts by Jimmy Brown, Jack Hargreaves and John Duckworth, Rovers were unable to score. Blackburn Rovers did even better in that year's Lancashire Cup. After victories against Accrington Wanderers (7-0), Church (6-0) they beat Blackburn Olympic 6-1 in the semi-final. Blackburn won the cup by beating Accrington 3-1 in the final. Strachan, George Avery. Sitting on the floor: Jimmy Brown and Jimmy Douglas. The following year Blackburn Rovers were in favourites to win the FA Cup. However, an injury hit Rovers were beaten 1-0 in the second round by local rivals Darwen. The Blackburn Times reported that this was a major surprise as the "play was so much in the Rovers' favour that Howorth (the goalkeeper) never handled the ball throughout the match." The defeat was made worse when the town's other main football club, Blackburn Olympic, became the first northern team to win the cup by beating Old Etonians in the final. In the 1883-84 season Blackburn Rovers added another outsider into the team. John Inglis, a Scottish international, had recently been playing for Glasgow Rangers. The Blackburn Times reported: "There is one point about Blackburn Rovers that does not give entire satisfaction and this is the introduction of Inglis of the Glasgow Rangers. It is "hard lines" on Sowerbutts or whoever else is supplanted, that after the faithful services of the past he should be pushed out in this manner, and besides that there is a class of people in the town who would rather lose the Cup on their merits than win it with the aid of a specially introduced stranger." In fact, Joe Sowerbutts, a local lad, had emerged as one of the stars of the team, and retained his place alongside Inglis. In the 1883-84 FA Cup Blackburn beat Padium (3-0), Staveley (5-0), Upton Park (3-0), and Notts County (1-0) to reach the final. After Blackburn Rovers beat Notts County the club made an official complaint to the Football Association that John Inglis was a professional player. The FA carried out an investigation into the case discovered that Inglis was working as a mechanic in Glasgow and was not earning a living playing football for Blackburn Rovers. George Avery and John Hargreaves. 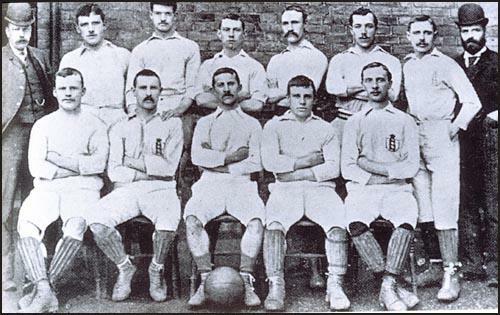 In January, 1884, Preston North End played the London side, Upton Park, in the FA Cup. After the game Upton Park complained to the Football Association that Preston was a professional, rather than an amateur team. Major William Sudell, the secretary/manager of Preston North End, admitted that his players were being paid but argued that this was common practice and did not breach regulations. However, the Football Association disagreed and expelled them from the competition. Blackburn Rovers, who denied they were paying their players, beat Witton (6-1), Romford (8-0), West Bromwich Albion (2-0) and Old Carthusians (5-0) to reach the final. Once again they had to play Queens Park. Blackburn Rovers was now a team full of internationals. This included James Forrest, Herbie Arthur, Joseph Lofthouse, Hugh McIntyre, Jimmy Brown and Jimmy Douglas. A crowd in excess of 12,000 arrived at the Oval to see the what most people believed were the best two clubs in England and Scotland. With goals from Brown and Forrest, Blackburn Rovers won 2-0. James Forrest won his first international cap for England against Wales on 17th March, 1884. The following year he was selected to play against Scotland. Scottish officials complained as they argued that Forrest was a professional. At the time he was receiving £1 a week from Blackburn Rovers. Forrest was eventually allowed to play but he had to wear a different jersey from the rest of the team. Forrest is now acknowledged as being the first professional to win an international cap. In 1884 Tom Mitchell became secretary/manager of Blackburn Rovers. At the end of the 1883-84 season Blackburn Rovers joined forces with other clubs who were paying their players, such as Preston North End, Aston Villa and Sunderland. In October, 1884, these clubs threatened to form a break-away British Football Association. The Football Association responded by establishing a sub-committee, which included William Sudell, to look into this issue. On 20th July, 1885, the FA announced that it was "in the interests of Association Football, to legalise the employment of professional football players, but only under certain restrictions". Clubs were allowed to pay players provided that they had either been born or had lived for two years within a six-mile radius of the ground. Blackburn Rovers immediately registered as a professional club. Their accounts show that they spent a total of £615 on the payment of wages during the 1885-86 season. Despite the fact that clubs could now openly pay their players, Blackburn Rovers continued to dominate English football. They reached the 1885 FA Cup Final by beating Darwen Old Wanders (6-1), Staveley (7-1), Brentwood (3-1) and Swifts (2-1) Seven of the Blackburn Rovers team were appearing in their third successive final, whereas Fergie Suter, Hugh McIntyre, Jimmy Brown and Jimmy Douglas were playing in their fourth final in five season. The game against West Bromwich Albion at the Oval ended in a 0-0 draw. The replay took place at the Racecourse Ground, Derby. A goal by Joe Sowerbutts gave Blackburn Rovers an early lead. In the second-half James Brown collected the ball in his own area, took the ball past several WBA players, ran the length of the field and scored one of the best goals scored in a FA Cup final. Blackburn Rovers now joined the Wanderers in achieving three successive cup final victories. 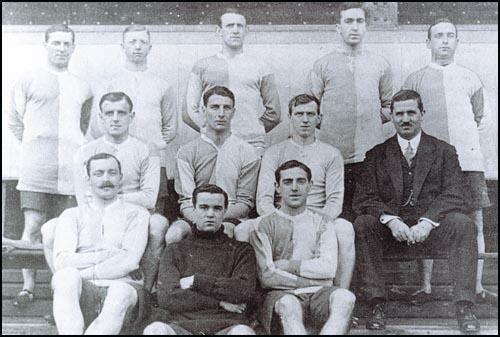 In 1887, Jack Hunter, the former England international and succesful player-coach at Blackburn Olympic joined the club. A member of the playing staff, Hunter later worked as an assistant coach at the club. Edgar Chadwick also joined the club that year. The decision by the Football Association to allow clubs to pay their players increased their out-goings. It was therefore necessary to arrange more matches that could be played in front of large crowds. In March, 1888, William McGregor, a director of Aston Villa, circulated a letter suggesting that "ten or twelve of the most prominent clubs in England combine to arrange home and away fixtures each season." The following month the Football League was formed. It consisted of six clubs from Lancashire (Blackburn Rovers, Preston North End, Accrington, Burnley and Everton) and six from the Midlands (Aston Villa, Derby County, Notts County, Stoke, West Bromwich Albion and Wolverhampton Wanderers). The main reason Sunderland was excluded was because the other clubs in the league objected to the costs of travelling to the North-East. The first season of the Football League began in September, 1888. Preston North End won the first championship that year without losing a single match and acquired the name the "Invincibles". Blackburn Rovers, who had lost most of their best players to retirement, finished in 4th place, 14 points behind Preston. At the beginning of the 1889-90 season Tom Mitchell, the club secretary, recruited four top players from Scotland: Tom Brandon, Johnny Forbes, George Dewar and Harry Campbell. These players joined local men such as James Forrest, Herbie Arthur, John Barton, Billy Townley, Nathan Walton, Joseph Lofthouse, Jack Southworth, Willie Almond, John Horne, Harry Fecitt and James Southworth. Tom Mitchell was particularly concerned with the position of goalkeeper. Herbie Arthur, at 36, was coming to the end of his playing days. Mitchell initially signed Ted Doig from Arbroath. However, he found it difficult to settle and after playing only one game he returned to Scotland. Billy McOwen, a local lad, played in 14 games that season. Eventually, John Horne took over as Blackburn's goalkeeper. The defence did not perform well that season letting in 45 goals in 22 games. Blackburn Rovers had little difficulty scoring goals. The team beat Notts County (9-1), Stoke (8-0), Aston Villa (7-0), Bolton Wanderers (7-1) and Burnley (7-1). Top scorers that season were Jack Southworth (22), Harry Campbell (15), Nathan Walton (14) and Joseph Lofthouse (11). Billy Townley. Front row: John Barton and James Forrest. 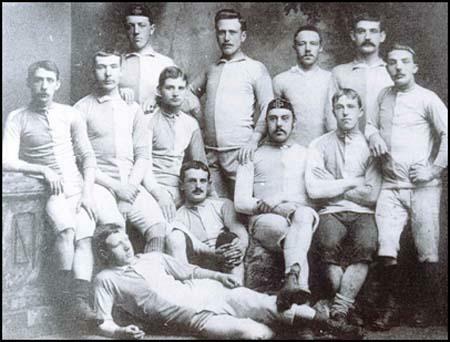 In the 1889-90 season Blackburn Rovers finished in 3rd place, six points behind Preston North End. They did even better in the FA Cup. On the way to the final they beat Sunderland (4-2), Grimsby Town (3-0), Bootle (7-0) and Wolverhampton Wanderers (1-0). Blackburn were odds-on favourites to win the cup against Sheffield Wednesday, who played in the Football Alliance league. Blackburn selected the following players: (G) John Horne, (2) Johnny Forbes, (3) James Southworth, (4) John Barton, (5) George Dewar, (6) James Forrest, (7) Joseph Lofthouse, (8) Harry Campbell, (9) Jack Southworth, (10) Nathan Walton and (11) Billy Townley. Blackburn took the lead in the 6th minute when a shot from Townley was deflected past the Sheffield Wednesday goalkeeper. Campbell hit the post before Walton converted a pass from Townley. Blackburn scored a third before half-time when Southworth scored from another of Townley's dangerous crosses from the wing. Townley scored his second, and Blackburn's fourth goal in the 50th minute. Bennett got one back for the Sheffield side when Bennett headed past the advancing Horne. Townley completed his hat-trick when he converted a pass from Lofthouse. Ten minutes before the end of the game, Lofthouse completed the scoring and Blackburn had won the cup 6-1. As Philip Gibbons pointed out in his book Association Football in Victorian England: "The Blackburn side had given one of the finest exhibitions of attacking football in an FA Cup Final, with England internationals, Walton, Townley, Lofthouse and John Southworth at the peak of their form." After their 1890 FA Cup success, the Blackburn Committee negotiated a 10 year lease with the Ewood racecourse ground. The cost was £60 per annum for the first five years and then £70 per annum for the remaining period. It was also decided to spend £1,000 to improve Ewood Park. In April 1891 the FA decided to use Ewood Park for the annual England v Scotland international. Surprisingly, the FA decided not to pick Blackburn players, John Barton, James Forrest, Joseph Lofthouse, Jack Southworth, Nathan Walton and Billy Townley. As a result the attendance at the game was less than 6,000 and produced only £664 in gate money. In an effort to improve the quality of Blackburn's defence, Tom Mitchell signed a new goalkeeper, John Gow from Scottish club Renton. However, he was eventually lost his place to local lad, Rowland Pennington. Although the defence did slightly improve that year, Blackburn was not as successful in front of goal and the club finished in 6th place in the league. However, Blackburn had another good run in the FA Cup and beat Middlesborough Ironopolis (3-0), Chester (7-0), Wolverhampton Wanderers (2-0), West Bromwich Albion (3-2) to reach their second successive final. Nathan Walton, Johnny Forbes, Coombe Hall and Billy Townley. Notts County were their opponents. Blackburn selected the following players: (G) Rowland Pennington, (2) Tom Brandon, (3) Johnny Forbes, (4) John Barton, (5) George Dewar, (6) James Forrest, (7) Joseph Lofthouse, (8) Nathan Walton, (9) Jack Southworth, (10) Coombe Hall and (11) Billy Townley. Blackburn Rovers put Notts County under pressure from the beginning and in the 8th minute, centre-half Dewar scored from a Townley corner. Before the end of the first-half, Southworth and Townley added further goals. Jimmy Oswald of Notts County did score a late consolation goal but Blackburn finished comfortable 3-1 winners and won the FA Cup for the 5th time in 8 years. At the beginning of the 1891-92 season John Barton suffered a serious injury that brought an end to his football career at Blackburn Rovers. Jack Southworth and James Forrest also missed a lot of games that season as a result of injuries. The club also lost the services of Tom Brandon who was transferred to Sheffield Wednesday after an argument with the Blackburn Committee. Blackburn Rovers also got into trouble with the Football Association after a game against Burnley in December 1891. Joseph Lofthouse was fouled by Alexander Stewart. The two men started fighting which resulted in both men being sent off my the referee. The Blackburn players thought that Lofthouse had been treated too severely and except for the goalkeeper, Herbie Arthur, walked off in protest. Arthur then refused to restart the game with a free-kick and the referee was forced to abandon the game. 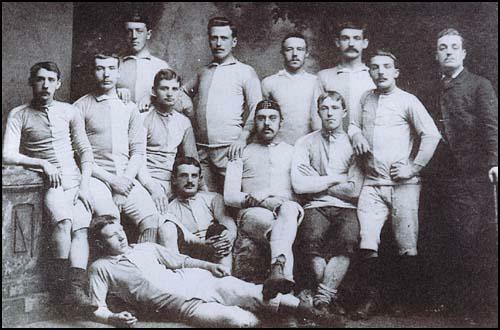 Blackburn finished in 9th position in the 1891-92 season. They were also knocked out of the FA Cup in the second round by West Bromwich Albion. Blackburn Rovers won their first game in the 1892-93 season against Newton Heath. Blackburn then began a bad run hat brought five draws and five defeats from their next 10 League games. Tom Mitchell, the club secretary, once again went to Scotland to recruit players. He signed Scottish international defenders, George Anderson (Leith Athletic) and Harry Marshall (Hearts). Johnny Murray, who had also played for Scotland, arrived from Sunderland. Blackburn still had problems with the goalkeeping position. Rowland Pennington lost his place after letting in seven goals in two games. Herbie Arthur was brought back into the side but he was dropped after conceding ten goals in three games. Mitchell then made the strange decision of putting inside forward Nathan Walton in goal. That year Blackburn finished in 9th place in the league. 28,000 spectators watched Blackburn Rovers beat Sunderland, 3-0 in the 3rd round of the FA Cup. There was a record gate of £760, the previous best being £454. One Blackburn supporter wrote after the game: "Southworth is the finest centre-forward and Anderson the finest half-back the world has ever seen, or ever will have the luck to see." Unfortunately Blackburn lost 2-1 in the semi-final to Wolverhampton Wanderers. The 1893-94 season saw Blackburn encounter serious financial problems. The costs of developing Ewood Park had not resulted in the expected higher attendances for marches. Only the visit of Sunderland brought a 10,000 plus crowd. Blackburn was forced to sell their main asset, Jack Southworth, to Everton for £400. Adam Ogilvie was signed as the new goalkeeper. He joined fellow Scotsmen, George Anderson, Harry Marshall, Johnny Murray, Johnny Forbes, George Dewar, Coombe Hall, Tom Brandon and Harry Campbell in the side. In 1894 Blackburn Rovers signed Patrick Gordon from Liverpool. Gordon replaced Jamie Haydock in the team. This upset the supporters and one man wrote to the local newspaper and claimed "Gordon is scarcely worth his place in the team after all. The wiseacres on the Rovers' committee think him a dashing outside-right. But he is not. Haydock is the best they have had for a long time." Gordon only scored 2 goals in 12 games and Jamie Haydock eventually got his place back. On May, 1895 Patrick Gordon was sacked from the club for what was described as "refractory conduct" during a tour of Scotland. It was also stated that he refused to play for the reserve team after he was replaced by Haydock. Blackburn continued to have trouble balancing the books and in 1895 the club made a public appeal for £1,500. A club bazaar raised £1,200 and all the players decided to contribute a week's wages to the fund. The 1895-96 season was a major disappointment. New signing Peter Turnbull, a centre-forward with a good goal scoring record when he played for Glasgow Rangers, Bolton Wanderers and Burnley, only managed seven in 25 games for Blackburn. The all-Scottish defence played well but the lack of goals resulted in the club finishing in 8th place in the league. Blackburn also lost the services of James Forrest, a man who had played in five winning cup finals for the club. Forrest left the club in October 1895 after he refused a request from the Blackburn Committee to register as an amateur in order to avoid paying him a wage. In October, 1896, Tom Mitchell, Blackburn's club secretary/manager resigned. His replacement was Joseph Walmsley, a local cotton mill manager. It seemed Blackburn missed Mitchell as they slumped to 14th place in the First Division of the Football League. The following season Blackburn Rovers lost the services of Jamie Haydock, Adam Ogilvie, George Dewar and Harry Chippendale. The only good news that year was the emergence of some talented youngsters such as Kelly Houlker, Bob Crompton, Tom Booth, Sam McClure, Tommy Briercliffe, Arnie Whittaker and Fred Blackburn. The team also included experienced players such as George Anderson and Tom Brandon. In the 1897-98 season Blackburn finished second from bottom. Only a decision to increase the size of the First Division of the Football League to 18 clubs saved Blackburn Rovers from relegation. The following season saw a revival with the team finishing in a respectable 6th place. However, they were beaten by Liverpool in the first round of the FA Cup. Blackburn found itself in another relegation struggle in the 1899-1900 season. The club had to win one of its last two games against Notts County and Preston North End in order to avoid the drop to the Second Division. Blackburn lost to Preston but managed to beat Notts County 2-0. Unfortunately this was followed by the news that Blackburn's former player, Jamie Haydock, had died after a long illness at the age of 27. The Blackburn Times criticised the performance of the Blackburn team arguing: "There can be no such thing as standing still in the football world as in many other things, and as the Rovers have not made headway they must have been going backwards. Alas, this is only too plain. The rovers of today are not the Rovers of yore, when their fame spread far and wide". The following season, two of Blackburn's most experienced players, George Anderson and Tom Brandon, left the club. Tom Booth, an English international, was sold to Everton and Tommy Briercliffe moved to Stalybridge Celtic. Considering the loss of these good players, Blackburn did well to finish in 9th place. Blackburn also won the Lancashire Cup beating Burnley 4-0 in the final. 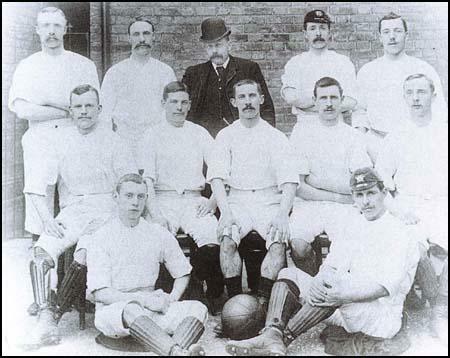 The 1901-02 season saw a major improvement in the form of Blackburn Rovers. For a while it looked like they would win the First Division title. However, Sunderland beat them 1-0 at Ewood Park and this started a poor run that left them in fourth place by the end of the season. Three of Blackburn's young stars, Fred Blackburn, Kelly Houlker and Bob Crompton, won international caps playing for England that season. The ambition of the club was questioned when one of the team's English internationals, Kelly Houlker, was allowed to sign for Portsmouth in the Southern League. He was replaced by Lionel Watson, who had been purchased from Manchester City. Bob Crompton had emerged as a superb talent. Despite only being 21 years old, he had become a commanding figure in the Blackburn defence and his leadership qualities resulted in him being appointed club captain. In 1902 Crompton won his first international cap for England. Playing at right-back he held his place in the team for the next 12 years. At the age of 24 he was appointed as England's captain. Blackburn struggled again in the 1902-03 season. Joseph Walmsley, Blackburn's manager, desperately needed someone to score goals and in March, 1903, persuaded Adam Bowman from Everton to join the club. With only a couple of games to play, Bolton Wanderers were already relegated. Blackburn Rovers and Grimsby Town were the main rivals for the second club to move into the Second Division. On Easter Monday, Blackburn Rovers had to visit Bowman's former club. Blackburn surprisingly beat Everton 3-0 with Adam Bowman scoring two of the goals. Four days later, Bowman scored another two goals in a 3-1 victory over Newcastle United. These two results meant that Grimsby Town, rather than Blackburn was relegated from the First Division of the Football League. Rumours began to circulate that Blackburn Rovers had bribed Everton players to lose the game. Officials at Grimsby lodged an official protest and the Football Association decided to hold an inquiry into the game. A report by the FA claimed that there was evidence that Joseph Walmsley had tried to arrange a win for Blackburn Rovers. However, they believed that Everton players had not taking any bribes and that the final league placings should remain unaltered. Walmsley was immediately banned from having any further involvement with football. In July 1903, Robert Middleton, a former school teacher, was appointed as Blackburn's new secretary/manager. Middleton purchased Bob Evans, a Welsh international goalkeeper, from Wrexham for £150. In November, 1903, Middleton also persuaded Fred Pentland, who had scored five goals in eight games for Blackpool, to join the club. Pentland scored seven goals in 18 league appearances, but his efforts could not stop Blackburn from being involved in another relegation struggle. The club eventually finished in 15th place in the league. Lionel Watson was the club's top scorer with 14 goals. In 1904 Robert Middleton signed Sam Wolstenholme from Everton. Wolstenholme, who was described at the time as being "a brainy and thoughtful right-half, as nimble as a squirrel", was a great success and played for England against Ireland and Wales in 1905. Despite good individual performances from Sam Wolstenholme, Bob Crompton, Adam Bowman, Bob Evans, Fred Blackburn and Arnie Whittaker, Blackburn could only finish in 13th place in the 1904-05 season. Bowman was the top scorer with 13 goals. In an article that appeared in the Blackburn Times a journalist wrote: "Like its two predecessors, the season of 1904-05 has been one of disgrace to the Rovers". Lawrence Cotton, a local wealthy businessman, became chairman of Blackburn Rovers in March 1905. The following month Robert Middleton signed Welsh international striker, Billy Davies from Wrexham. Ellis Crompton, another young player with a reputation for scoring goals, also joined the club. At the same time, two of Blackburn's best players, Lionel Watson and Fred Blackburn, joined West Ham United. Blackburn, an English international, left because he was upset with the decision not to grant him a benefit. Fred Pentland who was unable to maintain his goalscoring form, moved to Brentford in the Southern League. Blackburn Rovers finished in 9th place in the 1905-06 season. Adam Bowman was once again the club's top scorer with 15 goals. His strike partner, Billy Davies, added 11 more. That year, Blackburn's talented centre-half, Sam McClure, died after an abscess in the ear spread inwards towards the brain. The club also lost Arnie Whittaker who signed for Accrington Stanley. Robert Middleton made several significant signings that year, including Jack Martin, Edwin Latheron and Wattie Aitkenhead. Kelly Houlker, who had played for Blackburn between 1896 and 1901, also rejoined the club. However, now aged 34, he was passed his best and only managed 31 more games over the next two years. Lawrence Cotton helped to raise the money to improve the Elwood Park ground. On 1st January, 1907, the recently constructed Nuttell Street Stand was opened. It could accommodate 4,112 supporters seated in the upper tier, with room for a further 9,320 standing in front. A crowd of 35,000 watched Blackburn draw 1-1 with Preston North End. Blackburn Rovers finished in 12th place in the 1906-07 season. They were knocked out of the FA Cup by Tottenham Hotspur but won the Lancashire Cup when they beat Liverpool 3-0. Jack Martin proved to be a great buy and ended up the club's leading scorer with 17 goals. 1907-08 season was very disappointing. Blackburn Rovers was knocked out of the FA Cup in the first round when they were defeated by Second Division Leicester Fosse. They also had a first round exit in the Lancashire Cup. Blackburn's league form was little better and after a late rally they finished in 14th place. Billy Davies, Edwin Latheron and Jack Martin, ended up as joint top scorers with 9 goals each. After scoring 25 goals in 57 games Martin was surprisingly allowed to join Brighton & Hove Albion. Blackburn's new signings failed to shine. The Blackburn Times commented: "The second-rate players might advantageously be reduced and the money thus saved be utilized in paying the maximum wage to first-class men." Robert Middleton appointed the former Preston North End star, Bob Holmes, as trainer. This had a good impact on the team as they obtain 4th place in the 1908-09 season. Billy Davies scored 19 goals in 27 league appearances. This included four goals against both Bristol City and Everton. Ellis Crompton (10) and Edwin Latheron (9) added to the impressive number of goals scored that season. Blackburn also won the Lancashire Cup and the East Lancashire Charity Cup that season. Blackburn continued their good form the following season and by October 1909 they became leaders of the First Division of the Football League. They lost their position in January 1910 and finally finished in 3rd place behind Aston Villa and Liverpool. Blackburn's 45 points was the best total they had ever accumulated in a season. Blackburn's defence was outstanding that season. In goal was England international Jimmy Ashcroft. Bob Crompton and Arthur Cowell were a formidable full-back pairing. George Chapman played at centre-half whereas Albert Walmsley and Billy Bradshaw were the wing-halfs. An injury to Billy Davies caused the club serious problems in front of goal. Wattie Aitkenhead was top scorer with 14 goals and the consistent Edwin Latheron added 10 more. Ellis Crompton, who had the impressive record of scoring 20 goals in 35 games, joined Tottenham Hotspur in 1910 in order to get first-team football. Blackburn's away form that season was disastrous with their only win coming on the last day of the season. Although they won 12 games at home they could only finish in mid-table. This was very disappointing considering their 3rd and 4th positions in the previous two seasons. Top scorers were Billy Davies (16), Wattie Aitkenhead (13) and Edwin Latheron (11). Billy Davies, who had won eleven Welsh international caps during his career, was forced to retire in 1911. During his time at Blackburn Rovers he had scored 66 goals in 132 games. In 1911 Robert Middleton signed Jock Simpson from Falkirk for a fee of £1,800. He joined a foward line that included at different times in the season, Edwin Latheron, George Chapman, Walter Anthony, and Wattie Aitkenhead. Middleton also signed Alf Robinson to back up Jimmy Ashcroft. The defence looked very strong with players like Bob Crompton, Arthur Cowell, Albert Walmsley, Percy Smith and Billy Bradshaw in the side. The 1911-12 season began badly with Blackburn Rovers losing two of its first three games. Robert Middleton decided to move George Chapman from centre-half to centre-forward. This was a great success and Blackburn's form gradually improved and the team went on an unbeaten run that lasted three months. This took them to the top of the league. Despite being defeated by Bolton Wanderers and Arsenal, Blackburn went on another good run and by the end of the season they had three more points than main challengers, Everton. It was the first time in Blackburn's history that they had won the Football League title. Top scorers were Wattie Aitkenhead (15) and George Chapman (9). Jimmy Ashcroft and Alf Robinson played well and Blackburn only conceded 43 league goals. Only Everton let in fewer goals that season. Bob Crompton, Alf Robinson and Arthur Cowell. On 16th March, 1912, Wattie Aitkenhead won his first international cap playing for Scotland against Ireland. He made an immediate impact on his international debut with two goals in the first 23 minutes but was never selected again. Blackburn started the 1912-13 season very well and were undefeated until December. This was followed by five successive defeats. In an attempt to regain the championship, Robert Middleton broke the British transfer record by buying Danny Shea from West Ham United for £2,000. Patsy Gallagher, described Shea as "one of the greatest ball artists who has ever played for England... his manipulation of the ball was bewildering." Robert Middleton also purchased another forward, Joe Hodkinson for £1,000. Shea scored 12 goals but it was not enough and Blackburn finished 5th that season. Edwin Latheron (14), Wattie Aitkenhead (13), George Chapman (10) were the club's other top scorers. The defence played well and conceded only 43 goals league goals. Only Manchester City had a better defensive record that season. In July 1913, Alec Bell, the Scottish international left-half, joined Blackburn from Manchester United for £1,000. Bell was recruited as cover for the half-back line of Albert Walmsley, Percy Smith and Billy Bradshaw. As well as buying the top players, Lawrence Cotton also invested in ground improvements. He spent 7,000 on a new stand by the River Darwen. This provided covered accommodation for some 12,000 spectators. In the 1913-14 season Blackburn once again won the league title. Danny Shea was in great form scoring 27 goals. Edwin Latheron also did well that season with 13 goals. Both men also won international caps for England that season. They joined other Blackburn players, Billy Bradshaw, Jock Simpson, Bob Crompton and Joe Hodkinson in the England team. The defence also performed well and only let in 42 league goals that season. The following season Blackburn broke the transfer record again when they bought Percy Dawson for £2,500 from Heart of Midlothian. Blackburn Rovers scored 83 goals in 1914-15 season. However, their defence was not as good and Blackburn finished 3rd behind the champions, Everton. Dawson was top scorer with 20 goals. He was followed by Edwin Latheron (17), Danny Shea (13), George Chapman (9) and Wattie Aitkenhead (8). Bob Crompton played his international game for England in 1914. All told, Compton had gained 41 caps, 22 of them as England captain. As one commentator has pointed out: "Bearing in mind there were only three regular international matches each year, then the odd tour in the summer, in modern terms this would have equated to something in the region of 120 caps. No wonder that in his time he was considered the greatest player in the world." Blackburn Rovers was one of the first clubs to suggest that the Football League should be brought to a halt. Lawrence Cotton stated that: "We shall pull through some way or other, and then, after the war is over, we shall try to build up what we have lost. But for the present the one thing, and the only thing, is the war." Edwin Latheron was one of the many Blackburn players to join the British Army and served on the Western Front with the Royal Field Artillery. Latheron was killed during the offensive at Passchendaele on 14th October 1917 and is buried at the Vlamertinge New Military Cemetery. Lawrence Cotton became Mayor of Blackburn in 1917 and as a result of "the increasing pressure of civic and other duties" resigned as chairman of Blackburn Rovers on 19th February, 1919. There is one point about Blackburn Rovers that does not give entire satisfaction and this is the introduction of Inglis of the Glasgow Rangers. It is "hard lines" on Sowerbutts or whoever else is supplanted, that after the faithful services of the past he should be pushed out in this manner, and besides that there is a class of people in the town who would rather lose the Cup on their merits than win it with the aid of a specially introduced stranger. Our team journeyed to Blackburn the following Monday to try issues with the Rovers. Three minutes after the start the Blackburn side scored, and within ten minutes a second point was added to their account. As soon as the ball had been kicked off from the centre the Rovers with a rush carried it into our territory and got it past the goalkeeper again; and within a minute they scored a fourth goal, to the frantic joy of the spectators. Vaughton scored a goal for the Villa after this and some hard play, characterised by desperate rushes and a few fierce scrimmages ensued. The Rovers, however, were irresistible and lowered our flag seven times, only two goals being placed to the Villa account. The team returned home thoroughly disappointed. Blackburn, who were the first provincial team to appear in an FA Cup Final, were without England defender D. H. Greenwood... The Old Etonians were the last "All Amateur" side to win the FA Cup, as well as the last team south of Birmingham to win it during the nineteenth century. However, they appeared in their sixth final in 1883, where they met another team from Blackburn. For Blackburn Rovers, on the other hand, it was the start of a ten-year period in which they appeared in six FA Cup Finals. Our encounter with the Blackburn team took place on their ground and we took over with us Albert Brown, whose first season it was with the Villa and he played a most serviceable game. He is, as you doubtless are aware, still playing for the Villa and is considered to be one of the cleverest members of the team. He came from the Aston Unity and was the brother of Arthur Brown, my old centre-forward comrade. The match was fairly exciting, the tactics of the Rovers at the opening of the game being remarkably good. They scored a quarter of an hour from the start, Hugh McIntyre shooting the ball through goal. We equalised matters before half-time and directly after play was resumed Jimmy Brown, of the Rovers, lowered our flag again. But again we got level and in good time; and playing up in true form we began to press our opponents very hard. Then Albert Brown came to the front and sent the ball spinning through the posts for the third time. The Rovers felt called upon to make an effort and only by the cleverness of Mason, our goalkeeper, were we saved several times. Jimmy Brown, however, equalised matters again and now the intensist excitement prevailed, for we only had a few minutes to keep on playing. Fortunately, we were equal to the emergency and Olly Whateley kicked the winning goal just before the whistle blew. I regard this as one of our best matches and our win by four to three advanced us another step in local popularity. Jimmy Brown, whom I have mentioned, was a good centre-forward and had won international honours. After McIntyre - who also distinguished himself by his good play that day - he captained the team. Brown was very fast, a splendid dribbler, and a sure shot. The two Hargreaves, though not playing that day, were noted members of the Blackburn team and the elder of them was for some time captain, but had to retire on account of an injury to his leg. Among our own men who deserve special mention for their play against the Rovers is Vaughton; and Mason also worked well at goal. Blackburn Rovers redeemed themselves in the presence of 28,000 spectators by inflicting a decisive defeat on Sunderland in the third round of the Association Cup, on February 18th, 1893. Incidentally, there was a record gate of £760, the previous best being £454... Entranced by this achievement a jubilant supporter addressed the following post-card to the Press: "Southworth is the finest centre-forward and Anderson the finest half-back the world has ever seen, or ever will have the luck to see. Blackburn Rovers have never won a League match for the last three years without Southworth. There can be no such thing as standing still in the football world as in many other things, and as the Rovers have not made headway they must have been going backwards. Alas, this is only too plain. The rovers of today are not the Rovers of yore, when their fame spread far and wide.